Hey guys! These were done for a theme challenge for a nail group I'm in.. my first time ever doing one of those, haha. 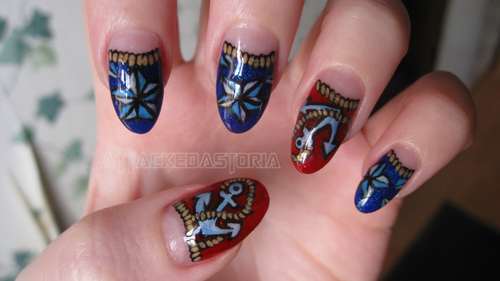 The theme was nautical/sailor related, so I went with anchors and nautical stars, obviously. They're alright.. I'm not 100% happy with them, the stars especially.. I hate stars. I was hissing and cursing the entire time I was doing them. I've gotten a few questions about the change in my nail shape.. I was bored, mainly. Oval's are kind of a pain to shape, but I'm enjoying how elegant they look and how they make my fingers look longer. And yes, these are still my natural nails. I'll probably be cutting them short after Dragon*Con. Not much else to say, really.. been hot as hell here! Ugh. Hope everyone's been staying cool. See you next time! I think you did a good work! They are very detailed! Wow these are awesome. Stars are a pain, but you've done a good job. My boyfriend's sitting here going "They must be stamped, you can't draw things like that!". i don't know why you aren't happy with these. they look ammmmmaaazzzziiinggg!! I don't even know what to call these..